Dominic Powelson, of Blue Line Protection Group, right, carries a satchel of cash through a Strainwise marijuana store in Denver on Nov. 17. 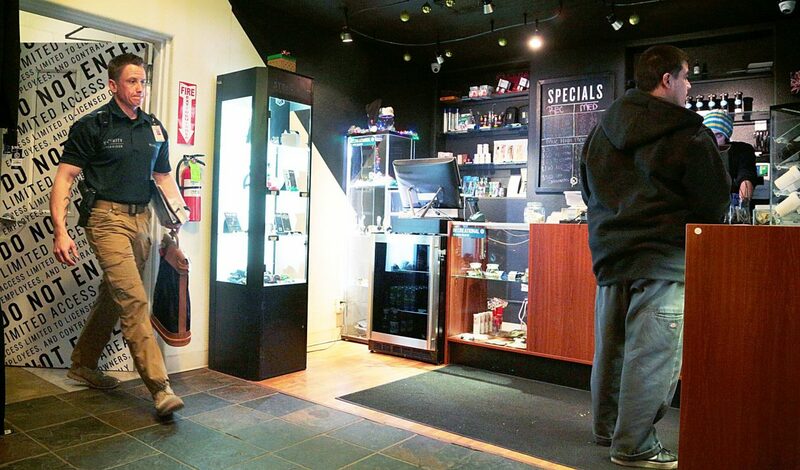 Legal marijuana businesses are a cash-heavy operation and several dozen rely on armored car services like Blue Line for cash transportation and protection. The federal government is stockpiling hundreds of suspicious activity reports that could provide federal agents with sufficient evidence to shut down any state-legalized marijuana business. And that distinct odor is considered a red flag by federal authorities who require that banks file a suspicious activity report for every transaction that might be associated with illegal activity, including selling marijuana, even for state-licensed businesses. Banks fear the repercussions of holding deposits related to marijuana, still a Schedule I illegal drug under federal law. That could mean prison time for individual tellers, fines for the bank and the bank could even lose its federal deposit insurance, meaning it could also be closed. “I’ve lost my personal bank account, my brothers have lost their personal bank accounts,” said Sally Vander Veer, operator of Medicine Man dispensary in Denver. The dispensary also lost its account in August. She said that without a bank account, all Medicine Man employees are paid in cash. State regulators in Colorado and Washington also have tried to ease access to banking. Chris Myklebust, the Colorado Division of Financial Services commissioner, issued a charter to the first ever marijuana-focused credit union in November. The new credit union will not immediately have federal credit insurance, although it has applied. Myklebust said the new credit union also must file suspicious activity reports. The so-called “SARs” stem from the guidelines set forth by the Financial Crimes Enforcement Network, a branch of the U.S. Treasury Department. The guidelines were meant to ease access to banks. “Banks are required by law to report when they think that a business is making money from something illegal, and marijuana is still federally illegal,” said Steve Hudak, spokesman for the Financial Crimes Enforcement Unit. The Aspen Times brings you this report in partnership with Rocky Mountain PBS I-News. Learn more at rmpbs.org/news. Contact Katie Kuntz at katiekuntz@rmpbs.org.